Click to download a flyer with the table of contents, and some endorsements. The flyer has a code you can use to purchase Rethinking the Environment directly from Routledge at a 20% discount. This book brings together the most current thinking about the Anthropocene in the field of Environmental Political Theory (“EPT”). It displays the distinctive contribution EPT makes to the task of thinking through what “the environment” means in this time of pervasive human influence over natural systems. It will be of interest to scholars already engaged in EPT, but it will also serve as an introduction to the field for students of Political Theory, Philosophy, Environmental Studies, and related disciplines. 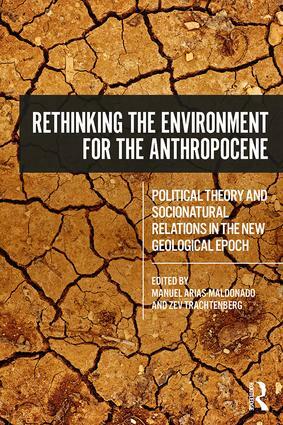 The text will help readers interested in the Anthropocene from any disciplinary perspective develop a critical understanding of its political meanings. This entry was posted in Environmental Political Theory, Reflections and tagged political theory, socianatural relations. Bookmark the permalink.